Find Dee on her website, her blog, on Facebook, and follow her on Twitter @DeeDeTarsio. I am pretty sure that if I had been around in prehistoric times, I would have found a way to be jealous of Ooga’s bigger rock. And of Mooga’s cave wall art, that you would recognize was a bison, instead of my cave art, which would look more like a scorch-mark from a first-day-with-the-fire cooking accident. And of Throat-Clearing Name—whom all the men lust after—and her lush, hair-covered body. No one is immune from the curse of jealousy and it’s my life’s work to try to defy it. Someone always has a better job, better body, better spouse, better book, better bank account, better kids . . . somebody better stop me! But it is only my definition of better that inspires the whole facade. When did I forget to appreciate things? Oh. I guess today is a reminder. What if Ooga’s mate died getting her that big rock? What if Mooga envied me my singing voice? (Trust me, she wouldn’t.) And what if Throat-Clearing Name yearned for my ability to see pictures in clouds, and was jealous of me and my super-sized thighs? As we swoop in on the winter solstice of stress, I need to confess that I am so gifted, I can even be jealous of how grateful someone else is. We’ll be gathered around that big table, heads bowed to share our blessings, and I always miss the heartfelt good ones because I am desperately trying to formulate my own. But this year is going to be different. I’m prepared. With my cheesecake pumpkin roll recipe in one hand, I will raise my wine glass high. My contribution may be a corny cornucopia of clichés, but here’s to Please, which always comes before Thank You. While I hate the way jealousy clogs my throat, maybe that’s why I like to write. I take that PBJ choking-sized bite, twist it, torture it, and throw it under the bus. Some of it is based on real-life events, but no one will ever know, because I’m not that good of a writer! I may deal with jealousy by a little sh*t-talking now and then, and end up mining my own pit of unmet needs. But by taking that wad of jealousy and celebrating everything and attaching to nothing, I can remind myself for at least thirty seconds to shine with benevolence toward my fellow jerk-face who has seemingly done nothing to deserve her good fortune. GAH! Dang it. There I go again. Let me rephrase that. By celebrating everything and attaching to nothing, I can take a moment to send up smoke signal thought-bubbles of Yes, Please! to the universe. So, thank you, Jealousy. Thank you for being a trend. Traveled down the road and back again. Your heart is green, you’re a pal and a confidant. When I take my seat at that big table this holiday, I’m changing it up to Happy Please Giving. I will dress Jealousy in a fancy big bow, and remember she is really Admiration and Inspiration—allowing me to be receptive to all the universe has on offer. Yes, Please! 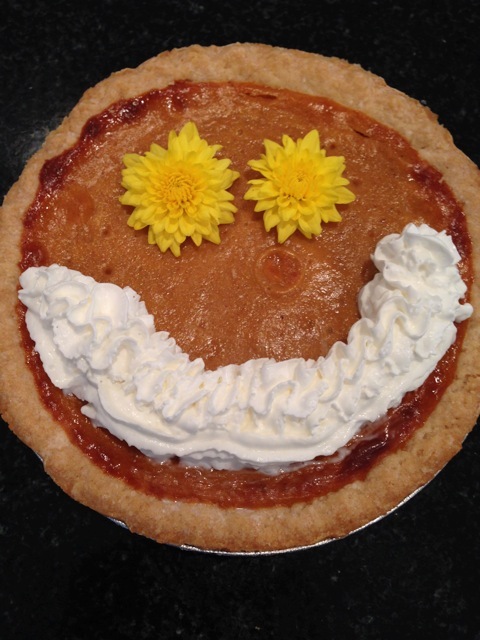 I will share my pie with Ooga and Mooga and Throat-Clearing Name, to celebrate how much they inspire me. Happy Please Giving! You’re welcome. Do you ever feel jealous? What do you do when you do? Any ideas you can share? How do you turn it around to be inspirational–or can you? You’ve written a wonderful post that reminded me of a recent experience. A few weeks ago I was singing with a group of very musical people, one of whom had also composed the piece we were performing. An amazingly talented, respected operatic soprano said to the composer something along the lines of “You are not only a fabulous performer but you wrote this wonderful piece of music, too. I’m so jealous.” The rest of us mortals just stared at her for a beat, then one said, “Oh, yes, poor you, with so little talent.” She had the courtesy to blush and laughingly admit she had deserved to be called out. As I’ve settled into what most people would call middle age, I’ve learned — most days! — to bloom where I’m planted because as you said, there is always someone who has more, does it better, sells thousands to my one, trills a higher note. Thank you for the entertaining reminder on this Please Giving morning! Thank you for your reminder, Jill: “Bloom where you are planted!” Happy Please Giving to you! You’re a hoot, Dee. It’s a good reminder that, in the English language, we use the word “Jealous” to cover both “Admiration and Inspiration” and “Covetousness.” Of course, as you alluded to, we cross from one to the other with the ease that one crosses from giving thanks to gluttony sometime around 3 this afternoon. You have a happy, covetous-free Thanksgiving! Happy Please Giving, Ron! Not to toot my own horn, I’m pretty-pretty good at gluttony, too! In response to your Andrew Gold homage, I was going to mine the lyrics to the classic Hey Jealousy. But then I figured out that would be admitting to my closet Gin Blossoms fandom. Hey Embarrassing! Then I thought I’d go for Natalie Merchant, but figured I wouldn’t fare much better there. So I gave up. I’ll just have to admire your cleverness and singing voice from afar, and cozy up by the fire with Throat-Clearing Name. We, the huddled sock-wearing slackers, who are left behind in the wintery heartland beyond those two October days, salute you, Oh-Swift-Generator-of-Hilarious-Books. We admire and are inspired by your flip-flop-wearing ease and prolific capabilities. Greetings to the Mighty Mitten! Don’t be a hater, Vaughn, it’s chilly here in San Diego this morning, too. I don’t think it’s going to hit 70 degrees for another hour, boo. Thank you for being a friend–Happy Please Giving! Oh, Liz, I am super jealous (I mean inspired!) by you!! Ha ha and Happy Please Giving!! Great post, Dee. Definitely something I struggle with, but like you said, I always just remind myself there will always be someone out there who’s got “more” or “better” of whatever. And there are also folks who have less. When I feel jealous, I remind myself maybe there are folks out there jealous of me. After all, I live in a beautiful place, with my fabulous hubby…. And I’ve met THE Dee DeTarsio in person! Happy Please Giving, my friend! Thanks, Jackie! I’m jealous of you, too, because I am in the middle of reading your awesome new novel, Rescue Me, Maybe! Brava!! Happy Please Giving! I’ve always made a distinction between envy and jealousy. To envy a person is to recognize he has something of worth and to wish you had it, too. Like, oh look, he has a golden retriever, I wish I could have one. You’re happy for the person, because he has something you find value in. To be jealous of someone is to see something they have that you don’t, and to resent them for it. Oh look, he has a golden retriever. It pisses me off that I don’t have one, too. I hope his runs away–that’ll show him. Instead of being happy for the person, you resent them for having something you don’t. The way I think of the terms, envy is okay, but jealousy is cancerous. Good point, Cal, thanks for commenting! Inspiration and admiration for what we don’t have, good! Resentment, bad! Happy Please Giving! When I read other writers’ work, I sometimes have to try very hard to extract jealousy from my evaluation. It’s so easy to go into the first chapter of a bestseller determined to hate it because this writer’s won dozens of impressive awards, it must be inaccessible flowery tripe; millions praise it to the skies, it must be crap like Fifty Shades; that glamorous head shot and dazzling smile are so annoying, she must be an airhead and her stuff is only barely readable thanks to well-paid editors. So if I read the first page and think, “Ha, this is terrible,” I have to stop and consider whether my judgment is entirely fair. Sometimes after trying very, very hard to see past my own prejudices, I come to the conclusion that, yes, this book is objectively terrible. And then I am relieved, and happily continue to grumble about the rank unfairness of the publishing industry, corporate America, and the universe as a whole. But sometimes–sometimes–it turns out I’m just grumbling about sour grapes. Oh, Tamara, you hit the nail on the head, especially for writers! I don’t think we can help ourselves from comparing what others are writing. But even that jealousy (read inspiration/admiration) can help us on our mission! Happy Please Giving! Dee, I am jealous that you wrote this post, because I was thinking about writing a post about jealousy. It’s one of my deadly sins (beside coveting my neighbor’s gas grill). It’s not that I want successful writers to die; perhaps just have gangrene. Still working on it. But Please, raise the wine glass high. Happy Thanksgiving to writers everywhere! Unzipping my grinch costume and peering out, I think we are all successful, because we have the challenge and the glory of working with words, and even if they often seem scuffed, modest things, a little editorial polish and the right belt can give them their moment in the light. PS–LOVE your Licking the Cat and Other Writing Tips! Me-owww! Ha ha, Tom! Now I am jealous of you and your comment! (And I admire your restraint in only being jealous enough to wish gangrene on others, awesome!) Cheers to you! I am jealous of your jealousy.